Wine-focused food and an intimate setting make this one of Santa Barbara’s favorite places to gather. 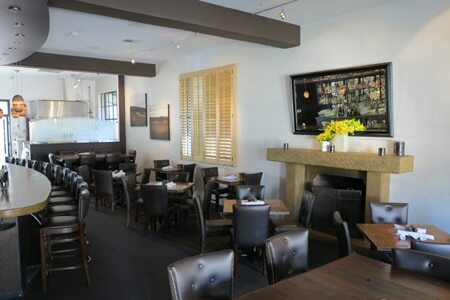 : Intermezzo Bar + Café, which shares a kitchen with its sibling Wine Cask, offers a varied menu. Dishes include poached lobster and leek terrine with white truffle vinaigrette and wild watercress, flatbreads, burgers made with Wagyu beef, and cheese and charcuterie plates. For salads, try the Belgian endive with crumbled blue cheese, chorizo, Marcona almonds and diced green apples tossed with a sherry vinaigrette. There are traditional tables and couches, indoor dining by the fireplace, and outdoors under white lights. Weekends see a huge influx of people, and the intimacy disappears quickly. This also means the service can get hurried and unfocused. There's an emphasis on local wines, including the owners', and they have a decent selection of cocktails and beers.